1. Allow curls to dry: Before you begin styling your curls, make sure your curls are completely dry. You can allow them to air dry or dry with a diffuser. 2. Tie your curls: While your curls are still loose, take a bungee string and tie it around your head. Wrap it around, tying at the front of your forehead. Carefully tie the string into a knot, making sure you don't pull your curls. Slowly pull the bungee cord back into a ponytail on the crown of your head, and then knot the string, which will hold the ponytail right in place. 3. Style your bun: Once the ponytail is created and secured, grab the center of the ponytail, pull up and tie the ends with an elastic. Once it's secured, tuck and pin the ponytail under itself, which will create a tiny bun. Once the tiny bun is secured, take the small pieces of leftover curls on each side of the ponytail. Twist the loose sections around each other. Once you've made the twists, pin the section inside of the bun. Repeat this until all the left over curls are taken care of. 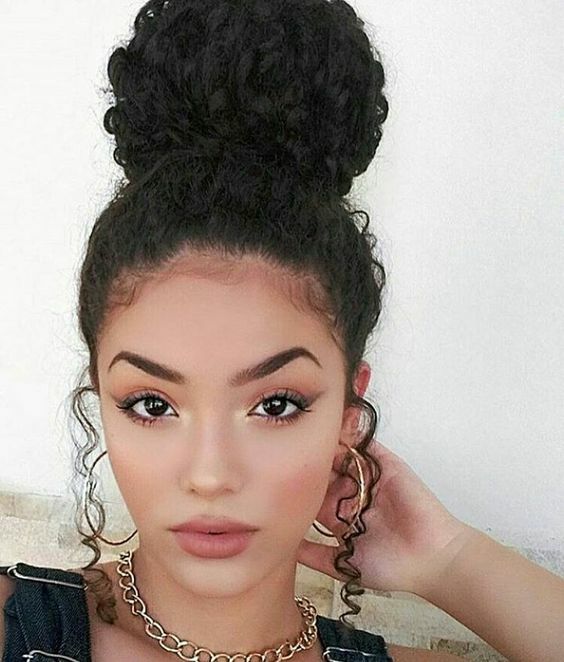 Once you've styled your bun, add pins as needed to hold your curls in place, add a sparkly pin or a cute scarf to customize your look!